Crochet snowflakes add a touch of whimsy to those dark winter days. And just as every snowflake is unique, every handmade snowflake holds it’s own bit of individual beauty as well. 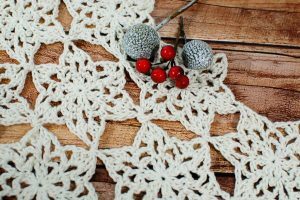 Although some snowflake crochet patterns might seem so delicate and intimidating a first, you’ll find that they follow the same techniques of working in the round that you are familiar with … only with a smaller hook and crochet thread! So, grab a cup of tea and a cozy blanket and crochet up a flurry of snowflakes with one (or all!) 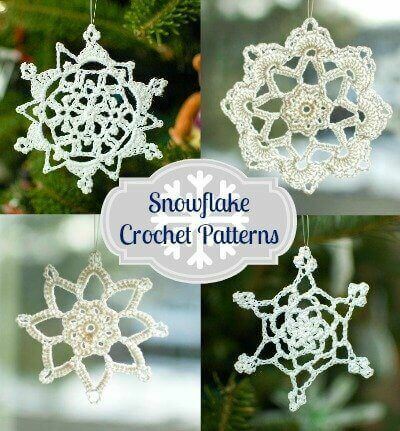 of these free snowflake crochet patterns! Make up a bunch to decorate your home, hang in your window, or dress your Christmas tree … they are also great to top off a gift! 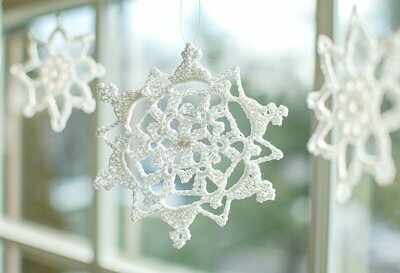 Crochet up some lace snowflakes for beautiful window decor! Bookmark this page or pin the image below so you can be sure to find the patterns again and again. You can find the links to go directly to each of these free snowflake crochet patterns in there descriptions below or by clicking on the image of the snowflake design you would like. The patterns are also available together as a Set of 4 Snowflake Patterns eBook, a convenient ad-free pdf download for purchase here in my shop or here on Ravelry. This pretty picot snowflake measures approximately 4 in. Although the pattern itself is only 5 rounds the design appears to be much more intricate. But my favorite part of this snowflake is the alternating triangular and picot points. 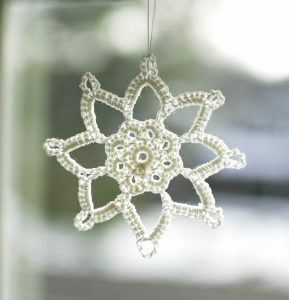 This dainty lace snowflake is the smallest of the bunch measuring a little over three inches. It features a lacy open design centered around a flower motif. 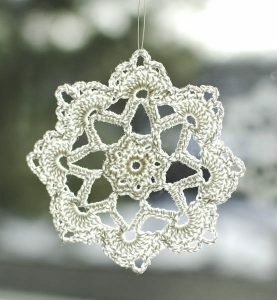 It pairs especially nicely with the pretty picot snowflake above! Everyone loved Grandma Jennie’s Snowflakes and she was always being asked for her pattern. She couldn’t decide which ending round she liked best so she alternated making the two for a truly beautiful winter window display. Version 2 follows Grandma Jennie’s Snowflake pattern from above with the addition of two final rows for more decorative effect. And while you’re in the snowflake spirit, try my free pattern for this whimsical snowflake table runner. 1996 was the deciding snow conditions that made us decide to move to southern California. I had 21 years of northern Ohio snow and then 40 years of New York Long Island snow – at my age, earthquakes rock!! 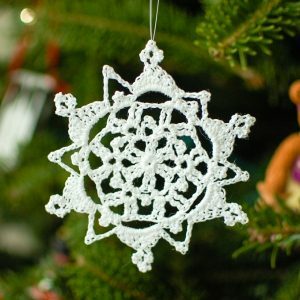 I’m going to try crocheting a snowflake … hopefully, they are geared for a beginner. Safe drifts and flurries, gentle snowflakes!! These snowflakes are beautiful and I love how each one is so different! I always enjoy crocheting snowflakes and they often adorn the gifts I give at Christmas. Thank you for the patterns!!! Thank You — very pretty. For those of you facing this storm, this is a wonderful idea, but I’d probably be working on headbands with built in ear warmers, mittens and socks/slippers I can layer. I’m such a wimp when it comes to the cold. Blessings to you all and may you all keep warm.